Cedar and Dixon Counties are collaborating again to update their Multi-Jurisdictional Hazard Mitigation Plan, which was originally approved by FEMA in October 2010. Representatives from communities across these two counties will join the County Emergency Managers to form a Planning Team to guide the planning process over the next several months. 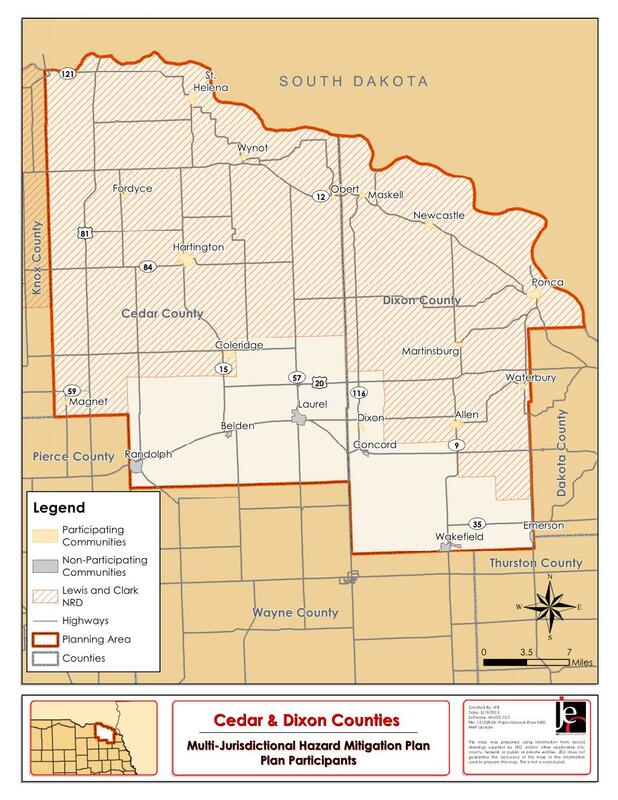 All communities, public school districts, natural resources districts, and other taxing authorities within Cedar and Dixon Counties are eligible and encouraged to participate. FEMA requires communities to have an approved and updated plan every five years in order to be eligible for mitigation grant programs. These federal grants allow for up to a 75% cost share for a wide variety of projects listed in the plan, which are available on an annual basis as appropriated by congress. Furthermore, for every $1 spent on hazard mitigation, $4 in post disaster recovery is saved, according to FEMA. JEO Consulting Group, Inc. (JEO) has been hired to assist with the plan development over the next 12 months. JEO assisted in completing Cedar and Dixon Counties’ current Multi-Jurisdictional Hazard Mitigation Plan. This hazard mitigation plan update is funded by a FEMA planning grant. The cost is shared 75% through federal funding and 25% through a local match, which Cedar and Dixon Counties are providing. Residents, communities, schools, fire departments, hospitals and more from Cedar and Dixon Counties were invited to participate in this process by attending meetings and providing information for the plan. Two Round 1 meetings were held in Cedar and Dixon Counties in early June. Community members that attended the meetings identified hazards of greatest concern, answered risk assessment questions, completed the mitigation status update worksheet, and reviewed an early draft of the participant section. Round 2 meetings were held in both counties during September. Representatives from participating communities, schools, and special districts attended a meeting to identify new mitigation projects and to review a second draft of their participant section. Thank you to everyone that was able to attend meetings! The HMP Planning Team was informed Monday May 23, 2016 that the Cedar and Dixon Counties Multi-Jurisdictional Hazard Mitigation Plan received FEMA’s approval. At this time, we are requesting that participating jurisdictions begin the process of adopting the plan. The governing board for EACH participating jurisdiction will be required to adopt the plan before they are eligible to pursue any hazard mitigation grant assistance. JEO has provided adoption resolutions to each county emergency manager, and they are also available for download on this webpage. When your jurisdiction has passed the adoption resolution, we ask that you provide (via email or USPS) a copy of the adoption resolution to the JEO team. These resolutions will be forwarded to NEMA for their records and inserted into the final version of the plan that will be provided to the participating jurisdictions. Also, the final approved version of the plan has been placed on this webpage, so you can download the relevant sections and provide those to your local boards prior to adoption.